This weekend’s Philosophy Football tour to Istanbul, the club’s twentieth, was an extraordinary success and I can honestly say it was one of the most momentous events in the 18-year history of the club. We were invited to participate in a 3sided match as part of the ‘parallel events’ of the Istanbul Biennial whose slogan ‘Mom, am I barbarian?’ was a direct response to the government repression and the protests against it since June. 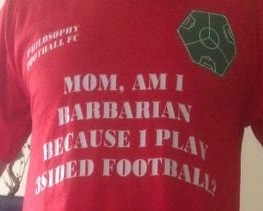 We adapted the slogan ‘Mom am I Barbarian because I play 3 sided football?’ for our tour shirt. The event was organised by Thomas Büsch, Sabine Küper-Büsch and Asena Hayal of InEnArt and included, in addition to ourselves, Ayazma FC from Turkey and Dynamo Windrad from Germany, both committed to political protest, fair play and internationalism. The match itself (of which more below) was very competitive while being played in a fantastic spirit of friendship as well as solidarity for the protests. The match, played directly in front of the Golden Horn, was was the first three-sided match to be played in Turkey, and was refereed by a former professional ref who was banned from refereeing in 2009 merely by the fact of being gay – he was by far the best ref we’ve ever had for any match, ever – and played with a distinctive pink football. The match was also preceded by a ‘slogan workshop’, and then a lengthy philosophical discussion on how to adapt the hexagonal pitch design to local conditions, and our proposal for the International 3Sided Football Federation. There were several TV cameras and journalists there from Turkish and German TV with a big crowd in attendance. The match itself was a predictably tight affair but with some really outstanding performances and, with a well balanced team, now experienced in 3sided football, we held on to our early lead and won 5-6-10 with Dynamo Windrad second. This was special enough. It was followed by a great rooftop party at the Büsch’s house and then at midnight, an impromptu 3sided match on Taksim Square in front of Gezi Park, the scenes since June of inspiring demonstrations as well as the repressive reactions by the Turkish government and police, using tear-gas and pepper spray. Another protester had been killed in another Turkish city in the days before amid growing tension. For that hour, between midnight and 1am on Saturday night, Taksim Square was a very joyful place. Locals joined in to play spontaneously. An old man, passing through the square at the time, saw the game, sniffed the air, and said ‘freedom’. The next day, in anticipation of another demonstration, police were out in force with tear-gas once again. There is so much more to be said and many photos will be available in the coming days but I want to thank some very important people. First our hosts, Thomas and Sabine, and the other teams. Then Filippo, who in the end couldn’t be physically present at the match but was present in so many other ways, throwing up ideas, insisting on the right venue, making the case for the shirt and galvanising the energy of others (above all me) and reporting on the match via Twitter, even interrupting his coverage of Gareth Bale’s Real Madrid debut to send news of the after-match in Taksim Square; Amanda, for terrific photos which will shortly hit your screens and currently going round Twitter; Mark Dyson, of the Deptford 3 Sided League, who made his debut for us and was a great asset in clarifying the 3sided game (he was one of the original psycho-geographers); Goober, who helped Ally in formulating the International 3Sided Football Federation’s charter and helped to clarify the 3sided rules. Above all, I want to thank our terrific touring party who won a famous victory and helped win many, many friends in Istanbul. Brilliantly led by Ally, our squad was Matteo, Henry, (who scored probably the best goal ever in a 3sided match), Matt, Mark and Joe. It was a really well-balanced team with a great mixture of skill, resilience and character and with the experience of previous 3sided games we got the tactics spot on. There are some photos on the InEnArt website here and here, with more photos, and a tour report from skipper Ally, to follow. Update: Ally’s tour report can be found here. Thanks a lot for two reports of our great time in Istanbul. I hope we gonna meet again next year – in Germany or Denmark. Thank you so much for widening our football – horizon! Everywhere is Philosphy! Everywhere is Dynamo! Everywhere is Ayazma! Everywhere is resistance! I`m Impressed by the the love to Football and his aims. Thanks to everyone from Dyinamo Windrad for making it such a fantastic occasion! We hope to see you again on an hexagonal football field next year.